The Hovawart is one of the most ancient breeds in the world, having been around during the Middle Ages. It originated in Germany as a herding dog and then later on became a guard dog. This breed thrives in a family environment and a good choice for first-time owners as it is placid, intelligent and eager to please. It develops a strong bond with its owners but could suffer from separation anxiety. Ready to welcome a Hovawart to your home? Here is a brief background of this even-tempered dog fondly called the Hovie. The Hovawart is German dog that is considered one of the most ancient breeds in the world as it was around since the Middle Ages as a herding dog. The earliest recording of the breed was in 1210 when Slavic invaders slaughtered one family and a Hovawart saved the lord’s infant son, the lone survivor in the tragedy. In 1473, it was regarded as one of the Five Noble Breeds because aside from being a guard dog it successfully traced robbers and other criminals. During the 20th century, the Hovawart’s numbers severely declined as newer breeds like the German Shepherd took on the breed’s job as a guard and working dog. In 1915, zoologist Kurt Friedrich Konig saved the breed from extinction when he put on breeding efforts by using similar-looking dogs from the Black Forrest region and crossed them with Newfoundlands, Leonbergers, German Shepherds, Bernese Mountain Dogs and an African hunting dog. In 1922, the first Hovawart litter was listed into the German Breeding Registry. The Hovawart breed was registered with the German Kennel Club in 1937. The Hovawart’s numbers once again declined during the Second World War. It remains a popular companion breed in its home country because of its even temper and adaptability but it is still considered a rare breed in other parts of the world, including the UK. The Hovawart is registered with The Kennel Club under the Working group. 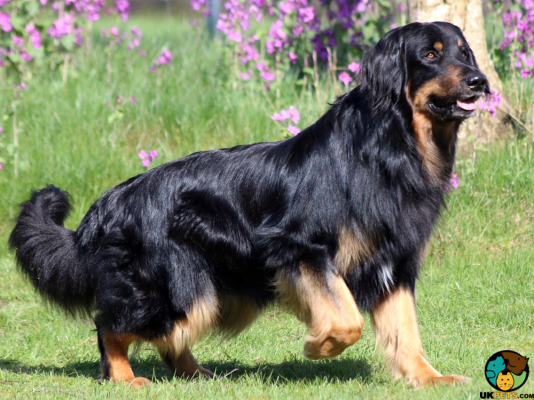 The Hovawart is a naturally beautiful medium to large dog that looks similar to various retriever breeds like the Golden Retriever. With males noticeably bigger than females, the breed stands 58 to 70 centimetres at the withers and weighs 66 to 88 pounds. It is a powerful dog that has a slightly longer body than it is tall. It has a clean head with a moderately broad skull, triangular ears and strong and deep muzzles that slightly taper to the nose, which has well-developed nostrils. It has oval-shaped and medium eyes that is either dark or medium brown. These lovely eyes give off an intelligence, endearing and keen look. The Hovie boasts of a beautiful long topcoat that is dense and close lying, which is either straight or slightly wavy. It also has a thin undercoat. The hair on the head and front legs is short, and is longer on the chest and belly, backs of the forelegs, and backs of the thighs and tail. According to KC standards, the accepted colours are black, blonde and black with gold. This handsome dog has relatively low grooming needs as it only requires brushing two to three times a week. This becomes more frequent during the spring and autumn when shedding is heavier. It is a clean dog that should only be bathed when needed to avoid stripping off natural oils. It is also important to maintain good oral hygiene by regular tooth brushing as well as providing your Hovawart with dental chews to remove tartar build-up. Also make sure that its ears are clean and nails trimmed. 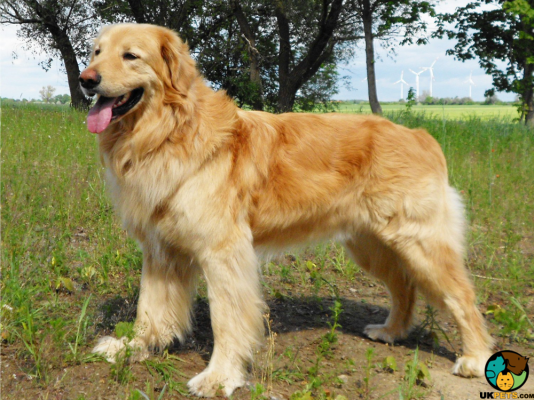 Hovawarts are often compared to Golden Retrievers not only in terms of looks but also their equable temperaments. This breed is placid, loyal and happy that thrives in a family environment, making it a good dog for any type of families. It is also a great breed for first-time owners as long as they are willing to provide for its needs especially its high exercise requirements. It develops a strong bond with its family and would always want to be part of every activity. The downside is that it cannot be left alone since it suffers from separation anxiety. It thrives in a setting with one person always staying at home. They may be even-tempered but Hovies will not hesitate to protect their family and property when necessary. They have a tendency to be wary of people but they are not usually aggressive as they would keep their distance for warming up to them. Hovies have a natural affinity toward children of all ages. However, they are better off with families with older kids that are mature enough to handle them. This being said, interactions should always be supervised to prevent untoward incidents when playtime becomes too boisterous. When socialised early, this breed gets along with other types of pets especially when raised together. The Hovawart is intelligent and a people pleaser, which means it can easily be trained, much to the delight of owners. Early socialisation and training are important especially that this dog matures quite late. Owners should strive to keep trainings interesting and short or this quick-witted dog will get bored. As a sensitive breed, it does not respond to harsh methods so better use positive reinforcement to help bring out its best qualities. A typical serving for an adult Hovawart is 2.5 to 4 cups of excellent quality dry dog food per day. To keep a trim body and prevent excess weight, make sure to divide its meals into two equal parts and avoid free-feeding. While you can prepare your pet’s food at home, the practical choice for your Hovawart is high quality kibbles formulated for medium to large dogs. The main ingredient should be animal protein such as bison, beef, lamb, or chicken. Avoid cheap supermarket brands that contain artificial ingredients and carb fillers like soy, wheat and corn linked to various illnesses. The Hovawart is a generally healthy breed that has an average life expectancy of 10 to 14 years when properly cared for. However, it is prone to a few hereditary health conditions such as bloat, thyroid issues, Hip Dysplasia, Liver Shunt, and Osteochondrosis. As previously mentioned, this breed has high exercise needs because of its high energy and quick-wittedness. It needs 2 hours’ worth of physically and mentally stimulating activities throughout the day. They can be in the form of walks, games and free time at a fenced yard. Why is it important to discuss the financial side of dog ownership? A lot of new owners get overly excited at the sight of cute puppies and do not realise the financial predicaments they bring. We at UK Pets always stress out the importance of responsible ownership because turning over a dog to a shelter for financial reasons is never a valid excuse. Is a Hovawart Right for You? The Hovawart is a rare breed in the UK so obtaining one entails being on a waiting list. It is intelligent breed that is eager to please. This breed is great for new dog owners. Its long coat is easy to maintain. The Hovie develops a strong bond with its owners and would protect them when necessary.